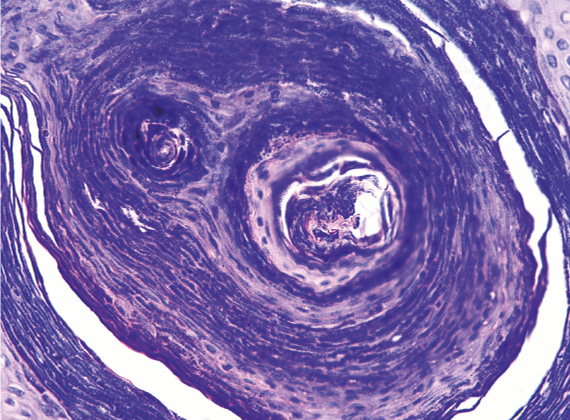 A case of unilateral axillar granular parakeratosis in a woman is presented. A macular hyperpigmented lesion was the initial clinical presentation and resolved completely. The physiopathology and unusual macular presentation are discussed. The macules could correspond to an initial form or a clinical variant of the disease. 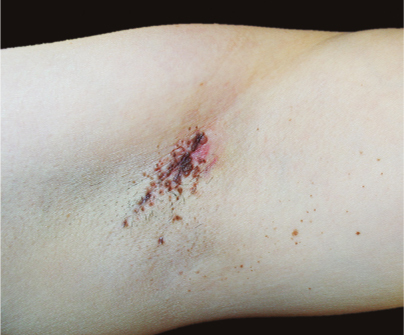 The patient received topical keratolytics with resolution of the lesions. Figura 4. Detalle de un infundíbulo folicular con importante hiperqueratosis y paraqueratosis, en su gran mayoría representada por retención de gránulos de queratohialina. Hematoxilina y eosina, 40X. 1. Ding CY, Liu H, Khachemoune A. Granular parakeratosis: A comprehensive review and a critical reappraisal. Am J Clin Dermatol. 2015;16:495-500. 3. González-de Arriba M, Vallés-Blanco L, Polo-Rodríguez I, Rosales-Trujillo B, Ortiz-de Frutos FJ, Rodríguez-Peralto JL, et al. 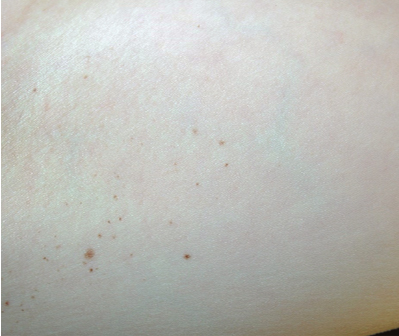 Paraqueratosis granular. Actas Dermosifiliogr. 2007;98:355-7. 4. Northcutt AD, Nelson DM, Tschen JA. Axillary granular parakeratosis. J Am Acad Dermatol. 1991;24:541-4. 5. Disorders of epidermal maturation and keratinization. En: Weedon D, editor. 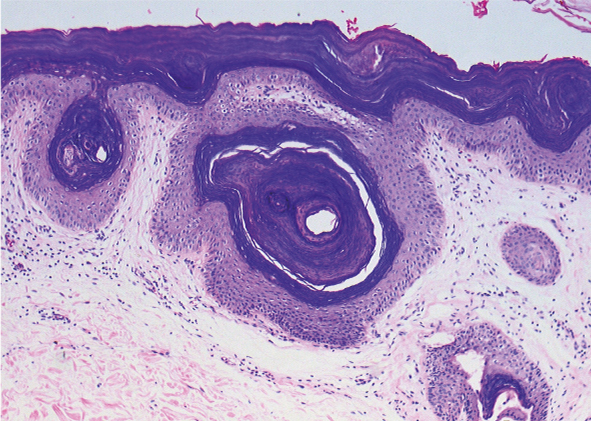 Skin pathology. Second edition. London: Churchill Livingstone; 2002. p. 304. 6. Mehregan DA, Vandersteen P, Sikorski L, Mehregan DR. Axillary granular parakeratosis. J Am Acad Dermatol. 1995;33:373-5. 7. Mehregan DA, Thomas JE, Meheregan DR. Intertriginous granular parakeratosis. J Am Acad Dermatol. 1998;39:495-6. 8. Metze D, Rutten A. Granular parakeratosis - a unique acquired disorder of keratinization. J Cutan Pathol. 1999;26:39. 9. Bolognia JL, Jorizzo JL, Rapini RP, editors. Dermatology. Second edition. Barcelona: Mosby Elsevier; 2008. p. 147-8. 10. Galvis W, Jaramillo-Ayerbe F, Soto CI. Paraqueratosis granular en niños. Rev Asoc Colomb Dermatol. 2012;20:192-5. 11. Rodríguez G. Paraqueratosis granulosa de la axila. Biomédica. 2002;22:519-23.